He is risen!!! The promise of Easter rings with joy from the mountains, sounds with hope in the valleys, and comes alive again in each of us. One favorite Easter scene is when an unknown Jesus speaks to travelers on the road to Emmaus. As Jesus brings alive the Scriptures – the triumph of life over death and rebirth over despair – something wonderful occurs: hope and love and wonder take root. The travelers sing out ‘Are not our hearts burning within us? Are not our hearts lighted with fire?’. Easter is here! He is risen! Once again, we remind ourselves and each other that Jesus conquers death and sin, bringing new life to the earth and to each of us. It is with that joy that we chose Heifer International for this year’s Easter offering. What a great way to celebrate the new life Christ gives us by sending the gift of live animals to our brothers and sisters. 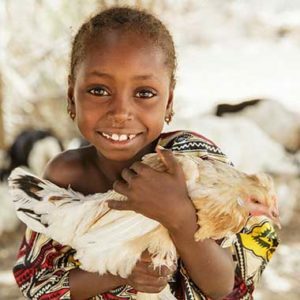 Many of you are familiar with the good work of Heifer International and their mission to end poverty and hunger around the world. From their deep Church of the Brethren roots to ‘provide a cow, not a cup’, Heifer has focused on bringing animals and values-based training to poor communities across the globe. Animals: Whether it’s honeybees, a heifer, or a water buffalo, Heifer knows the economic power animals can bring to a family and community. They call this power ‘The 7 M’s ‘ , representing the valuable benefits that farm animals supply to people. These 7 M’s are milk, manure, meat, muscle, money, materials and motivation. Training: Heifer also understands community. They provide first-rate training that encourages people to use their collective strengths and values to overcome what is often felt to be a hopeless situation of poverty. One example: every family who receives a gift of animals from Heifer pledges to provide offspring from these animals to another family in need. So let’s have some fun and fill our own ark of animals to send to communities around the world! An Easter offering gift of $20 will send a flock of noisy chicks. $30 will send buzzing honeybees. $250 will provide a strong and mighty water buffalo. A sheep, pig, or goat can be sent to a family for $120. And $500 means someone in need now has a heifer and a brighter future. He is risen indeed! Let’s shout it from the rooftops and, in praise of our God, make our small but direct impact on hunger and poverty. To make this part of your Easter celebration, you can write a check to First Congregational Church with “Heifer Project” in the memo line and either send it to us in the mail or bring it to church and put it in the offering plate. There will also be envelopes in the pews during the Easter services within which you can place a check or cash. Finally, you are always welcome to Venmo money to the church if you indicate where it is directed so we can send many animals!